How can I improve my posture during Pregnancy? We begin this post with a list of do’s and don’ts that will help you improve your posture during pregnancy and keep your body happy. Keep reading to find these pointers in detail. 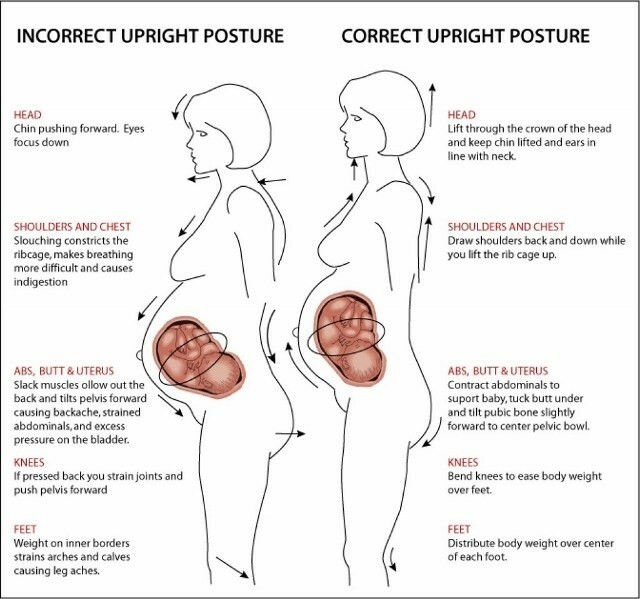 Here are few do’s or good practices that will help you improve your posture during pregnancy and keep your body happy. Vary work positions continuously, from sitting to standing and walking. Keep your hips and knees at a right angle when sitting (use a foot rest or stool, if needed). Your feet should be flat on the floor. Try to practice relaxation techniques for stress free pregnancy. While standing, hold your head up straight with your chin in. Keep shoulder blades back and your chest forward, knees straight, buttocks tucked in. Here are a few don’ts that will help you improve your posture during pregnancy and keep your pregnant body happy. Don’t worry about frequent urination due to drinking plenty of fluids. It only gives you extra chance to change your position and move around. Minimise heavy lifting, climbing or carrying. How should you sit in bed while pregnant? While sitting – use a small cushion to provide the extra support to the arch of your lower back; if needed. Take care that the back is straight and well supported. Avoid slouched sitting – even though it may feel comfortable for a while but consistent slouching can stress the already sensitised muscles during pregnancy & increase the risk of aches & pains. While sitting, take care that the back is straight and well supported with knees bent & touching the floor. You may use a low stool to support the feet. Is it ok to wear a seat belt in car when pregnant? Just because you are pregnant; do not avoid the use of shoulder and the lap belt. Your safety matters all the more. Use the shoulder as well as the lap belt. Wear the lap belt under your belly closer to the hips. Shoulder belt must be placed between the breasts. In case you are driving, support the curve of the spine with a small cushion, pull the driving seat close to the steering wheel. Make sure your belly is around 10 inches away from the steering. What is the best sleeping position when pregnant? If you are pregnant, it is best to sleep on your left side with knees slightly bent with a pillow between your knees, unless suggested otherwise by your doctor. Is it ok to lift something heavy during pregnancy? Try and avoid heavy weight if you are heavily pregnant. If you have to, then use both your hands to lift a weight. Even when you're lifting something light, proper form can spare your back. Bend at your knees, not your waist. Keep the load close to your body, lifting with your legs — not your back. What care should be taken while standing when pregnant? Avoid standing for longer duration. Keep changing the posture intermittently. When you need to stand longer, keep the feet separated & do not lock your knees. You can keep one foot on a small stool in case of long duration standing. This will take off the load/strain built up on your back due to long duration standing. How does pregnancy affect posture? Our Prenatal physiotherapists very often get asked this question. Afterall, how is pregnancy changing the normal body biomechanics. Pregnancy changes your posture from being straight to arching your back with an added support from your hand to your back. These changes occur to accommodate your growing baby & manage your centre of gravity for better stability. When a woman is pregnant, her pelvis begins to tip backwards as the baby develops, to balance the forward weight of the expanding uterus. As the pubic and tailbones move backward, the arch in the lower back increases. As the lower back arch increases, so does the curve in the upper back or thorax. The shoulders and head move forward and the chest collapses to balance the changing weight. All these changes can increase stress on the spine, exaggerating its natural S shape. Other muscles and ligaments can also get strained. 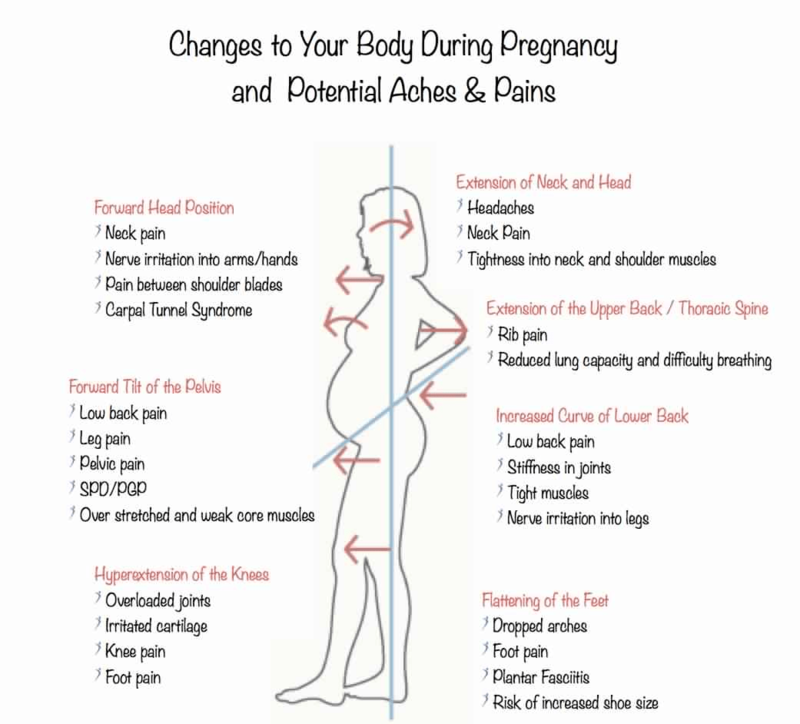 What are the common aches and pains arising due to posture changes during pregnancy? These changes ultimately lead to serious back pains, neck pains & at times pelvic pains due to increased strain & muscular imbalances due to the changing postures. Expecting moms who have participated in FabMoms, a Prenatal Exercise Program have often reported lesser pregnancy related pains. This article is contributed by Dr Anuradha M. (PT), who is a Certified Childbirth educator (USA). Dr Anuradha is immensely popular among her women clients for her practical approach to prenatal and postnatal care, accurate diagnosis and treatment for women’s issues. Prenatal yoga has helped popularise the benefits of prenatal exercises. Prenatal fitness propagated by ReLiva Prenatal Experts emphasises on safe exercises during pregnancy that also prevents back pain during pregnancy. Ergonomics in the workplace has become very important. Workplace injuries often result from poor posture. Ergonomics expert from ReLiva Physiotherapy share tips to improve workplace environment and correct posture for sitting, standing or working and avoid back pain, neck pain, shoulder and finger issues. Ergonomics is the process of designing or arranging workplaces, products and systems to make them comfortable for use. Ways to manage the workstation ergonomically for our body to get biomechanically equipped to work better.